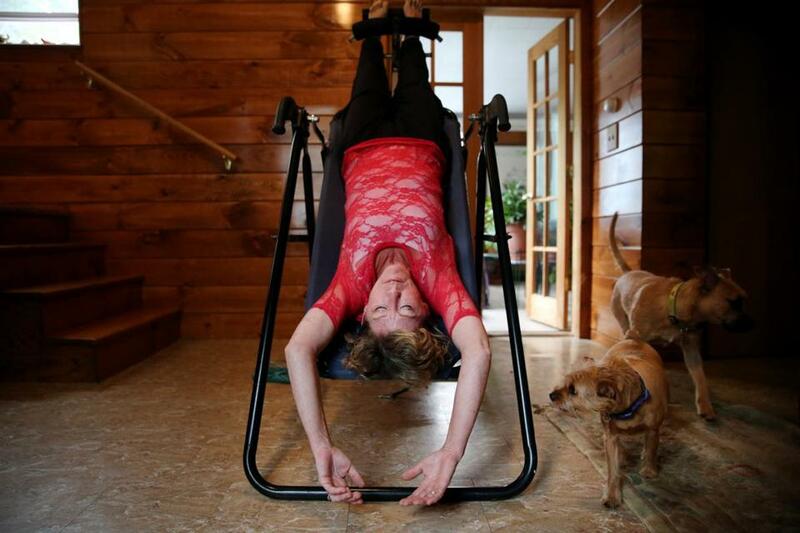 Barbara deJager used an inversion board to stretch her spine at her home in South Hamilton, Mass. Third in a series of occasional articles on people contending with chronic pain. For our first article, click here. For our second article, click here. Julia Sullivan makes her own medicine, toasting marijuana buds in her oven, simmering them in oil, dripping the oil into capsules. She learned the recipe from people she found online or at a dispensary, people whose attention to detail reminds her of wine connoisseurs and craft beer enthusiasts. But in 2015, she joined the thousands of people who have registered with the state to legally possess marijuana for medical purposes. And she is among an unknown number of people who use marijuana to quell chronic pain. For them, cannabis brings relief without the perils and discomforts of prescription opioids. In entering that world, patients find themselves far afield from the usual experience of medical care. Doctors can recommend marijuana — but they can’t prescribe strains or dosages. No pharmacist is on hand to give advice on the startling array of buds, foods, tinctures, and lotions. And insurance doesn’t cover it. “Cannabis is not an entrance drug, it is an exit drug from pharmaceuticals and narcotics,” she said. The number of people holding state certification to possess marijuana has risen steadily, with 30,000 patients enrolled by the end of August, up from a little more than 12,000 a year earlier. But it’s hard to tease out the presence of chronic pain patients in this growth. The law allows marijuana for any “debilitating condition” that limits life activities, but the state does not provide statistics showing the condition that prompted patients’ use of marijuana. Ellen Lenox Smith, 66, suffers from chronic pain, and she grows and prepares marijuana for herself and five other people. Recent research suggests a relationship between access to marijuana and lower use of opioids. And according to a study released this year, Medicare patients received fewer prescriptions for conditions — including pain — that marijuana can alleviate, as states adopted medical marijuana laws. Although medical marijuana is legal in Washington, D.C., and 25 states, including the six New England states, the federal government still outlaws the drug and classifies it as dangerous, on a par with heroin. Even where medical use is legal, patients can find themselves on the fringes of legitimacy. Before a dispensary opened in Brookline, for example, Sullivan got her marijuana from someone she found online who delivered it to her door. George Beilin, a psychologist who runs a chronic pain support group in Beverly, said many patients he knows are turning to marijuana as an alternative to opioids, or to reduce the opioids they take. But the majority, he said, cannot afford the dispensaries and must obtain the drug on the street. For months, Barbie deJager of Hamilton relied on a friend to buy cannabis cookies for her at a dispensary. She didn’t have the identification card needed to shop for herself, because she couldn’t afford the $200 fee to pay a doctor to certify that marijuana was appropriate. She finally came up with the money and said she recently visited a doctor and obtained the card. DeJager starts each day with a few nibbles of the cookie. It tastes awful, but it eases the severe back and leg pain that, at its worst, feels like sitting on upturned forks. With three or four bites in the morning with her coffee, and a few more nibbles midafternoon, her pain becomes manageable. DeJager, 49, has struggled with pain for 15 years, ever since two disks in her back suddenly failed. Despite steroid shots, a spinal implant, and surgery, she still needed drugs — a progression of opioids that eased the worst of the pain but left her too fuzzy-headed to drive. She found marijuana lessened her pain while keeping her mind clear. “I feel in control, I don’t have the ups and downs the way I did with opiates,” she said. 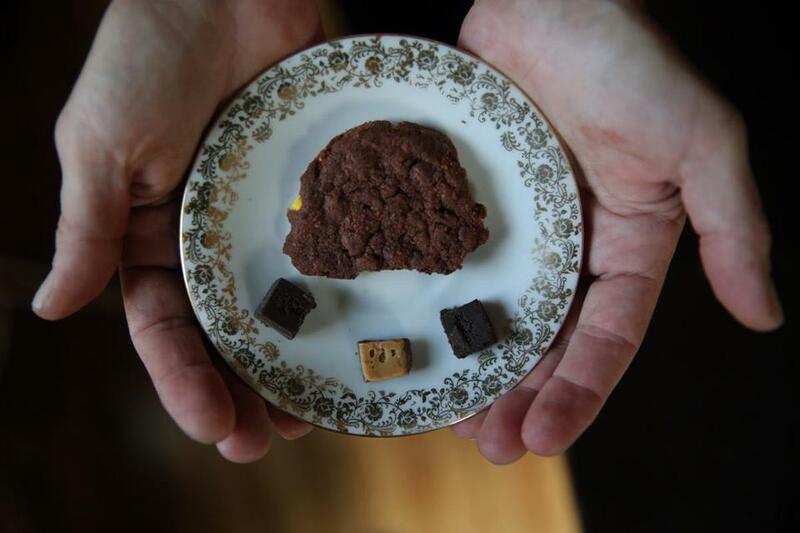 DeJager spends $100 every two weeks for a batch of two dozen marijuana cookies. Methadone — the drug most recently prescribed for her pain — is covered by insurance and cost her only $3.65 for 120 tablets that lasted more than a month. But unlike with prescription medicines, patients using marijuana have to make their own decisions about what to buy. Patients tell her that even once they find a product that works, often it’s no longer available on the next visit to the dispensary. She attends a support group of marijuana users run by Dhanabalan, where participants share notes on the effects of different strains. Certain varieties are thought to have anti-inflammatory properties, for example, and others are less likely to affect the mind. When Eddy found a combination that relieved pain and kept her clear-headed, the effects proved “extraordinarily helpful, shockingly helpful.” Now, she inhales the drug through a vaporizer every day, mostly at night. 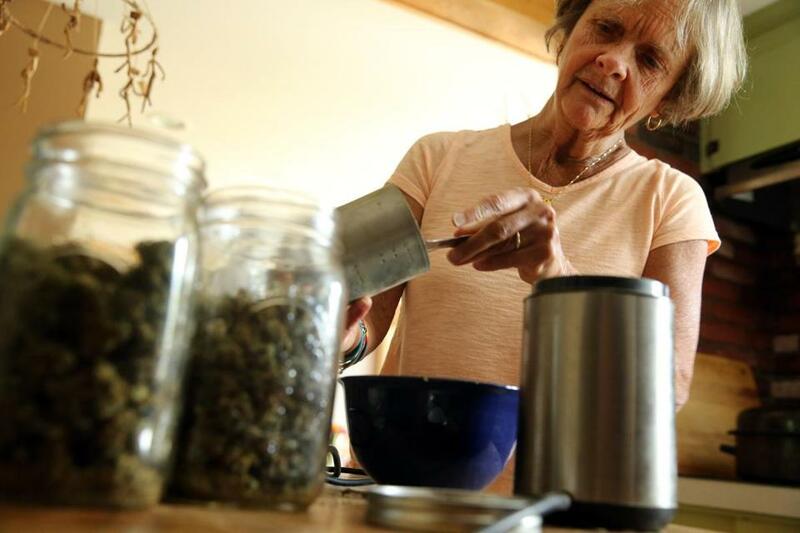 Eddy, who is 69, credits marijuana with extending a career at risk of ending because of the pain in her hands. Dr. Kevin P. Hill sees that kind of trial-and-error approach as less than ideal. Often, important medical decisions are guided by dispensary workers with little medical training. Barbie deJager, who suffers from back pain, starts each day with a few nibbles of a marijuana cookie. Hill, a psychiatrist at McLean Hospital who studies marijuana addiction, said marijuana can help with chronic pain and other conditions. It is safer, he said, than alcohol and opioids — it does not cause fatal overdoses. But marijuana is not risk-free. In the short term, cannabis can impair memory, judgment, and balance, and can cause nausea and dry mouth. Taken over time, marijuana can exacerbate depression or anxiety, and can trigger psychosis in young people who have a family history of the disorder, Hill said. And a minority of users become addicted, he said. Dr. Alan Ehrlich, a family medicine professor at the University of Massachusetts Medical School who has studied the evidence for medical marijuana, said the most compelling data support marijuana use to treat pain associated with nerve damage and symptoms of multiple sclerosis. For other purposes, the evidence is limited. “It’s an absence of data. It doesn’t mean it’s an absence of benefit,” he said. Hill and Ehrlich said they believe marijuana should be available for medical use, but they are troubled that Massachusetts patients seeking the drug can rarely get help from their own doctors. Only 167 doctors have registered with the state to certify patients for marijuana, and a small number write the majority of recommendations. It was a doctor who suggested marijuana to Ellen Lenox Smith, who lives in Rhode Island, where the rules are different. But she was desperate. A genetic condition that causes her joints to dislocate had left her knotted in pain, needing a wheelchair, sleepless. And she was unable to tolerate the drugs her pain specialist prescribed. In 2007, Smith finally tried marijuana, obtained from a friend of her son, and infused it into a teaspoon of oil. She didn’t get high, but she slept through the night for the first time in years. And her pain was lessened throughout the next day. “I could tell very quickly this was my answer,” she said. Today, the 66-year-old retired teacher has marijuana plants growing in her basement, marijuana buds drying in her living room closet, and bottles filled with marijuana-infused oils in her pantry. She runs her legal indoor farm to supply five other people. Felice J. Freyer can be reached at felice.freyer@globe.com. Follow her on Twitter @felicejfreyer. Kay Lazar can be reached atkay.lazar@globe.com. Follow her on Twitter @GlobeKayLazar.